Winding Device - Dimple B.V. Along with the growing demand for washcloth in 500metre rolls, the need for winding machinery has grown drastically over the past few years. Initially introduced as a service item, winding machinery is now a mature product-line which completes the graphical line of business. Make your own cassette rolls and save money. 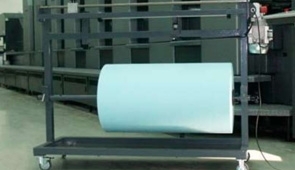 The winding device and parts such as spindles are available for all print presses that currently equipped with automatic blanket cleaning systems. Systems are supplied in both manually operated and automatic manner. Systems for popular presses are available from stock.